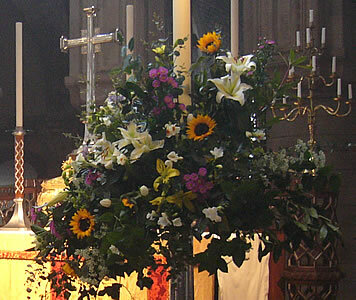 This page gives a brief introduction to some of the traditions in the UK on Easter Sunday. Easter and Christmas Day are the two most important religious days for Christians. 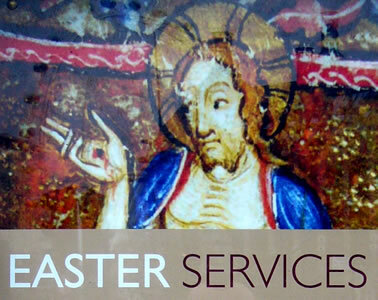 Easter Sunday marks the end of a period known as Lent. The name "Easter" (and the German name for it: Ostern) comes from Eostre, the ancient name of an Anglo-Saxon goddess of spring. The name used in some other European countries is derived from the name for the Hebrew festival called the Passover (French: Pâques, Italian: Pasqua, Spanish: Pascua). 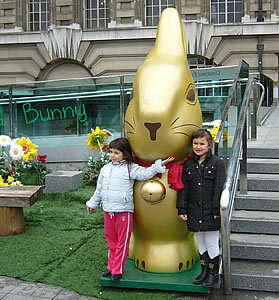 Many shops in the UK are closed on Easter Sunday, even if they normally open on other Sundays. On Good Friday Christians remember the crucifixion (death on a cross) of Jesus Christ. Two days later, on Easter Sunday, they celebrate his resurrection (return to life). 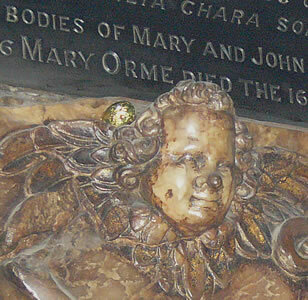 Church altars are usually decorated with flowers. The displays often include white lilies. A white lily is a symbol of the Virgin Mary (the mother of Jesus). The colour white represents ideas such as innocence, peace and hope. 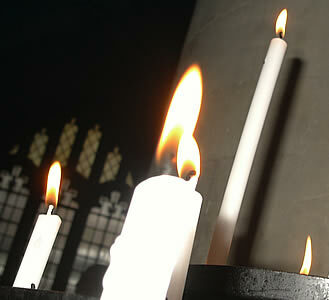 Churches may be kept dark on Maundy Thursday or Good Friday, but on Easter Sunday they are usually brightly lit with candles. 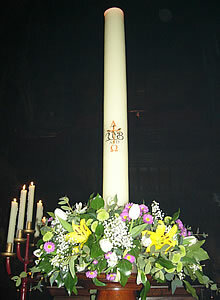 There is a special Paschal candle which is larger than the others - a new one is blessed each Easter (sometimes at a special service called an Easter Vigil on the evening before Easter Sunday). It is lit during services for the next 50 days (the seven weeks between Easter Sunday and Pentecost Sunday) and on special occasions during the rest of the year. 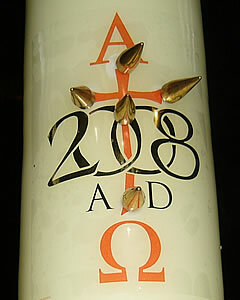 There are special markings on the Paschal candle. In the middle is a cross, sometimes including five marks which represent the wounds of Jesus (nails were driven through each of his hands and feet, and a spear was put through the side of his body). There are also written the first and last letters of the Greek alphabet (alpha and omega) and the current year: these represent the idea that God's spirit is present everywhere and at all times. 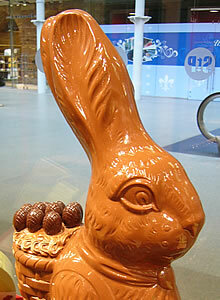 It is common to eat a chocolate Easter egg on Easter Sunday. The most common type is a large chocolate shell containing a packet of other sweets inside. Parents often give one of these to each of their children as a gift. 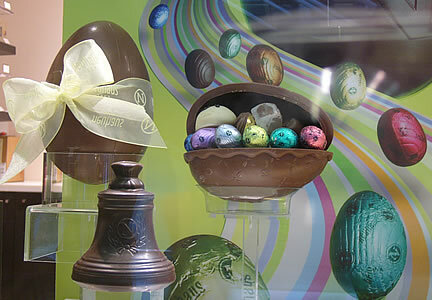 In the UK in recent years it has become increasingly common to eat egg-shaped chocolates at other times of the year as well, especially in the time between Christmas and Easter. An egg is an appropriate symbol for Easter because it can be both a sign of the coming of spring (when birds lay their eggs) and can have Christian meaning because it represents the creation of new life (like the resurrection of Jesus). A Simnel cake is sometimes eaten at Easter in England and Ireland. 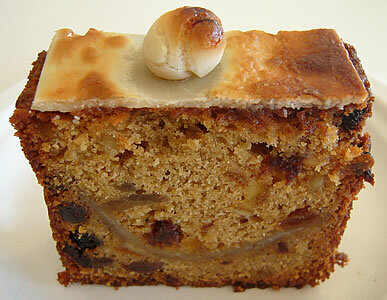 This is a fruit cake with a thin layer of marzipan on the top, and another similar layer baked in the middle. The Easter version of this cake usually has eleven marzipan balls on the top: these are Christian symbols, each ball representing one of the apostles (followers of Jesus). There were actually twelve apostles, but one of them (Judas) is excluded because he betrayed Jesus. This type of cake is sold by local bakers and is available in some teashops and supermarkets. An egg hunt is often organised as an event for children. 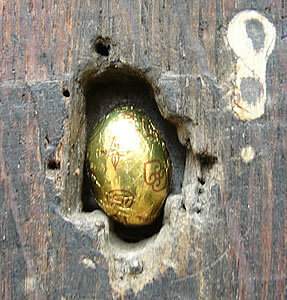 Several eggs are hidden in a building or in a garden, then children are sent to look for them. When the egg hunt is indoors chocolate eggs are hidden and the person who finds an egg can keep it and eat it. 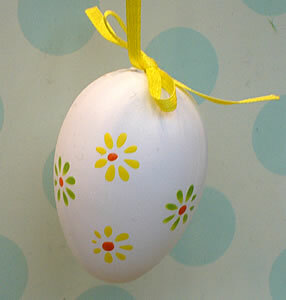 When egg hunts are organised outdoors, the eggs which are hidden are made from paper or other materials and are later exchanged for chocolate eggs. 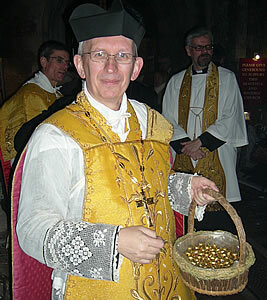 The egg hunt shown below was organised by a church (the Priory Church of St Batholomew the Great, in central London) after its Easter church service. An egg trail is a treasure hunt. You need to solve a series of clues, each of which leads to the location of the next clue. Once you reach the final location you can receive some chocolate eggs. This type of event is often organised by a museum, country house or park. Egg rolling races are outdoor events. Children roll hard-boiled eggs down a slope, competing to reach the bottom first. Bunnies (baby rabbits) are are used as symbols at Easter: like eggs, they represent spring as well as the idea of new life. 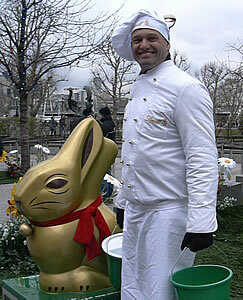 Chocolate bunnies are becoming a popular alternative to chocolate eggs. In Germany and some other countries (such as the United States) children are told that at Easter they are visited by the Easter Bunny, which leaves them eggs or other small gifts. In the UK the Easter Bunny sometimes appears at events for children, but this is not a common part of the Easter celebrations.